1990 was a memorable year for boxing. In January of that year, Mike Tyson was considered to be pound for pound the best boxer in the world. That all changed on February 11, 1990 when James “Buster” Douglas defeated Tyson. Douglas had four losses on his professional record. Needless to say, Douglas was not expected to win. I remember watching Tyson and Douglas being introduced in the ring. Douglas was bouncing up and down looking focused and determined. Douglas had even more motivation because his mother died about three weeks before the fight. Tyson was walking back and forth from one side of the ring to the other looking somewhat lackadaisical. After seeing both of them, I said “He’s gonna lose.” I was referring to Tyson. I just wanted to say it so that it was not just a thought. I would not have made this prediction the day before the fight. During the fight, Tyson did not have the same head movement and quickness that he displayed in his previous fights. Tyson was still young, so this happened probably because his training was not as good. Tyson was fit and not fat, but he was not in the best physical condition for a world championship. Douglas was more motivated than he had ever been and his training and conditioning reflected that. In the tenth round, Douglas landed a right uppercut to the head that stunned Tyson. Douglas quickly followed that up with more punches to the head which floored Tyson. Tyson got up on wobbly legs and the referee stopped it. Before this fight, Julio Cesar Chavez of Mexico was considered to be pound for pound the second best boxer in the world. After Tyson lost to Douglas, Chavez took over the top spot. When a unification title fight takes place between two world champions, there is increased interest from the fans. In March 1990, a highly anticipated matchup was scheduled which generated much more attention than usual. Chavez was the WBC super lightweight champion at the time, but he previously was a world champion in the super featherweight and lightweight divisions. According to BoxRec.com, Chavez’s record was 68-0 with 58 knockouts. His opponent was Meldrick “TNT” Taylor of Philadelphia, Pennsylvania. Taylor was the IBF junior welterweight champion. Taylor’s record was 24-0-1 with 14 knockouts. The super lightweight and junior welterweight divisions are the same 140 pound weight class. It is rare that two undefeated world champions in the same division who are both top ten boxers pound for pound and in their physical primes would be facing each other. A fight of this caliber today would definitely be on pay-per-view and similar in magnitude to a potential middleweight matchup between Gennady “GGG” Golovkin and Saul “Canelo” Alvarez. I recall when Chavez vs. Taylor was about a week away from happening. At the time, I had been a fan of boxing for about five years. I was a valet that parked the cars of customers at a prestigious hotel. The valets had a small shelter separate from the hotel where the valets stayed while waiting to park or retrieve cars for customers. This shelter was known as “The Shack.” Some of the valets thought it was amusing to fart inside the shack. Usually, these farts smelled so bad that one of the valets would light and smoke a whole cigarette in order to mask the odor of the intestinal gas. The carcinogenic fumes from the cigarette were preferable to breathe in than the foul stench from the flatulence. A few days before the fight, I was discussing the matchup inside the shack with one of my coworkers. I predicted that Taylor was going to defeat Chavez. My reasoning was that a pound for pound top ten boxer such as Taylor could win by decision against Chavez. My coworker disagreed and said that Chavez would win. He then asked me if I wanted to make a bet on the fight as to who would win. I said that I don’t bet and that I just believed that Taylor would win. My coworker persuaded me to bet a little bit of money, so I said that I would bet one dollar. He said that is not enough, so then I said that I would bet five dollars. He still rejected that, so I said that I would bet ten dollars. He thought about it for a few seconds and then accepted that amount of money to wager. Chavez vs. Taylor was broadcast on the HBO cable television network. The fight was going to be in Las Vegas, Nevada on March 17, 1990 and Richard Steele was chosen as the referee by the Nevada State Athletic Commission. The fight was called “Thunder and Lightning” which referred to the thundering punching power of Chavez and the lightning fast hands of Taylor. The first round of the fight went as expected. Chavez is not usually a fast starter and Taylor was able to win the round with his rapid punches. Taylor still outlanded Chavez in round two, but Chavez did well towards the end of the round. In round three, Taylor was fighting a lot on the inside which was an opportunity for Chavez to do damage. Taylor should have thrown quick combinations and then moved away. Taylor and Chavez were at close range and even leaning on each other. This was working in the early rounds when Taylor was fresher and not hurt. From rounds one to three, Taylor threw twice as many punches as Chavez. Chavez landed a couple of hard shots to the head in round four, but the round probably was won by Taylor. Chavez and Taylor were leaning on each other trading body blows and doing a lot of inside fighting in round five. Taylor was landing more which enabled him to win the rounds and build a lead on points. In round six, they were fighting not at close range as often. Taylor probably won the round because of his activity. Although it was not as apparent in the first half of the fight, Chavez’s punches were taking a toll on Taylor and this would be noticeable in the second half of the fight. Taylor and Chavez were fighting at close range in round seven and both were landing to the head and body, but Taylor threw and landed more. In round eight, Chavez was uncharacteristically moving away from Taylor a couple of times after Taylor’s fast flurries. Taylor was faster and threw more frequently than Chavez in round nine. Harold Lederman of HBO believed that Taylor won rounds one through nine, but I did not know how the judges were scoring it. I believed though that Taylor was winning, but I also knew that it’s not over until it’s over. There were still three rounds left and great champions find a way to win. In round ten, Taylor was landing several punches to Chavez’s head, but Chavez kept coming forward and weathering the storm. Chavez’s granite chin made this possible. Chavez and his cornermen believed he was behind on points, so Chavez was looking for the knockout. Chavez was taking more of the punches just to dish out some of his own, but they both were very active. Chavez may have won the round and he probably hurt Taylor more. In round eleven, this fight was starting to look like a Rocky Balboa fight with punches being thrown and landed often. Rocky was depicted in the movies as being from Philadelphia which is the same city that Taylor was from. However, Taylor did not have the punching power like Rocky to go toe-to-toe with Chavez for 12 rounds. Although the judges’ scores were not known at the time, I believed that Taylor had a comfortable lead. I would have recommended him to get away from Chavez as much as possible in the twelfth round. Trading punches with Chavez was like playing with fire. If you keep playing with fire, you are eventually going to get burned. Taylor was showing signs of fatigue and damage with swelling around both of his eyes. Trainers Lou Duva and George Benton gave Taylor the wrong advice before the twelfth and final round. They both told Taylor that he needed to win the last round. Taylor was actually winning by a large margin on two of the scorecards: one judge scored it 108-101 while the other judge scored it 107-102. One biased judge had Chavez winning by a score of 105-104, but his score did not matter. If the fight went the distance, Taylor could win by a split decision. I did not care if Taylor lost the last round by a score of 10-9. I just did not want Taylor to get knocked down or out. In the last round, there was one minute left and I was looking at the time tick away. Every second brought me closer to winning the bet and having my prediction come true. They traded blows throughout the last round. I shouted “Get out of there!” I wanted Taylor to run away. There were 30 seconds left. Taylor was still on his feet. Chavez was running out of time. With just 24 seconds remaining, a straight right from Chavez staggered Taylor, but then Taylor came forward. Taylor was trying to win the round as his cornermen instructed him to do. A right hook to the head by Chavez moved Taylor in a corner of the ring. Taylor was now cornered by Chavez. Taylor’s hands were both low. With 17 seconds left, Chavez landed a laser-like straight right to the head. Taylor was down. I shouted “No! Get up!” I was worried he would not get up, but Taylor got up immediately and I was relieved. It’s almost over, I thought. Even if Taylor loses the round by a score of 10-8, he will most likely win by decision. Referee Richard Steele asked Taylor twice “Are you okay?” Taylor said after the fight that he responded. Steele said that Taylor did not respond. Taylor turned his head looking off to the side and that is when Steele waved his arms signaling that he was stopping the fight. The official time of stoppage was 2:58. Only two seconds remained. I shouted profanity. Within 15 seconds, I went from worry to relief and then to anger. What an appropriate last name for the referee! Steele stole victory away from Taylor! This is not fair! I lost the bet and was wrong in my prediction because of Steele! I found out later that Taylor’s trainer Lou Duva had jumped onto the ring apron which caused Taylor to turn his head and look that way. This was at a critical time when Steele was asking Taylor if he was okay. Taylor’s cornermen failed him. They gave him the wrong advice in telling Taylor that he needed to win the twelfth round and then Duva stepped on the ring apron which distracted Taylor as Steele was determining if he could continue fighting. There were only two seconds left. Chavez probably would not have got to Taylor in time to land a punch if the fight resumed. At work, I saw my coworker who I made the bet with in the shack. I immediately spouted all the reasons why the bet should be cancelled because of the controversy. He allowed me to get it all out of my system and then there was silence for a couple of seconds. He then said just two words to me. It wasn’t the profane phrase that has the first word that starts with an F and the second word that starts with a Y, but it might as well have been. He simply said “Who won?” It was in that moment that I realized that the controversy would never change the result of that fight. Even though Taylor was winning at the time the fight was controversially stopped, Chavez was declared the winner. Taylor played with fire and he got burned, but Steele stopped the fight which I still did not agree with. I looked down and stared at the floor, resigned to my loss of the bet, and answered my coworker. “Chavez,” I reluctantly replied. I wanted to show my displeasure with how the fight ended. I decided to go on a lunch break, but I did not intend to eat lunch. I went to sit in my car and took out all the one dollar bills that I received from tips. I knew I had to pay my coworker ten dollars, but there was nothing stated in the bet regarding the condition of the currency. Some of the one dollar bills that I had were in such bad shape and discolored that they looked like the money of another country instead of the United States. They were not greenbacks anymore. They were brownbacks. I guess the customers of the hotel wanted to get rid of their nasty one dollar bills. I closely examined each one dollar bill and excluded from consideration the ones in good condition. I put two bills next to each other to see which one had more of a brownish hue. Only the bills in the worst condition would qualify for my “terrible ten.” It took me about a half an hour to make my selections. When I looked them over one last time, I knew that I had made the right choices. Each bill looked like a duplicate of the other, although these were real and not counterfeit. All of them were brown, dirty, and in very poor condition. I returned to the shack and saw the valet who won the bet. Eager to get rid of the financial filth and fulfill my obligation of the bet, I put the ten dollars in his hand. “Here,” I said. He began to count it to verify that it was ten dollars. I watched him as he was counting, wondering if he would notice what I had done. He then fanned them out like playing cards and looked at them for a few seconds. Suddenly, he said “What did you do?! Pick out the worst ones? !” With a slight smirk, I said “Yup.” After my reply, his facial expression changed to shock and disgust. We just stared at each other while the look on our faces seemed frozen: me with a smirk and him looking shocked and disgusted. There was silence and it felt kind of awkward, so I said something that I felt would lessen his concerns. As if I had to state that this money was still legal tender and could be spent the same way as money that was crisp and clean, I said “It’s still money.” His face remained unchanged and still looked the same. He stared at me for a few more seconds and then shook his head in disgust and walked out of the shack. Even if Steele did not stop the fight and Taylor had won, most of Taylor’s prime was beaten out of him by Chavez. In 1991, Taylor won the WBA welterweight title against Aaron Davis and he successfully defended that title only twice. Taylor next challenged WBC super welterweight champion Terry Norris. Taylor lost by TKO. Taylor then tried to regain the WBA welterweight title, but lost by TKO to Crisanto Espana. Conversely, Chavez defended his WBC super lightweight title several more times in the 1990s. In 1993, Chavez challenged WBC welterweight champion Pernell Whitaker, but it was scored as a draw and Whitaker retained his title. In 1994, Chavez lost to Frankie Randall by split decision. Chavez won against Randall in the rematch because of a technical decision in which the fight was stopped because Chavez was cut from an accidental clash of heads. Chavez was leading on two of the three judges’ scorecards at the time of stoppage. Chavez and Taylor had a rematch in 1994 with Chavez’s WBC super lightweight title at stake. Taylor no longer had the hand speed and lightning fast reflexes that he displayed a few years earlier. Chavez may have been a bit past his prime, but he was still a formidable opponent. In the eighth round, a left hook to the head by Chavez floored Taylor. Taylor was able to get up and the fight was allowed to continue, but Chavez immediately landed more punches and Taylor was not throwing back. Referee Mills Lane stopped the fight and Chavez won by TKO. I watched the HBO show Legendary Nights: The Tale of Chavez – Taylor in 2003. 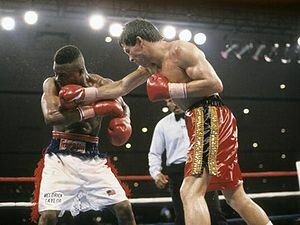 The first Chavez vs. Taylor fight was known as the best fight of the 1990s and it occurred in the first year of that decade. Taylor had been sent to the hospital after that fight. He had a facial fracture and was urinating blood. It was horrifying for me to watch Taylor talking on the episode of Legendary Nights. He obviously had brain damage because his speech was slurred. Before he fought Chavez, Taylor was articulate and in his prime. Losing ten dollars and being wrong in my prediction that Taylor would win seemed insignificant compared to Taylor’s problems. Taylor could have won against the best boxer pound for pound in the world and given Chavez the first loss of his pro career if the fight was not stopped with just two seconds left. So close, yet so far.